It is Saturday, October 12, and I am in my house, and AUKLET is in the driveway. My psyche hasn’t quite caught up with the physical realities (like there’s no motion! ), but it’s nice to be home. There’s a possible storm next weekend, and the weather has been in the 40s at night. I’m happy to be taking the easier route this year, coming ashore before the serious fall weather. And the drive back here was lovely, with the fall colors really in gear in the higher elevations around Worcester. Pulling the boat out of the water went well, and AUKLET was high and dry by about 8 AM, after starting early to beat the falling tide. And we had a tremendous group! There’s nothing more fun than a party at the dock. 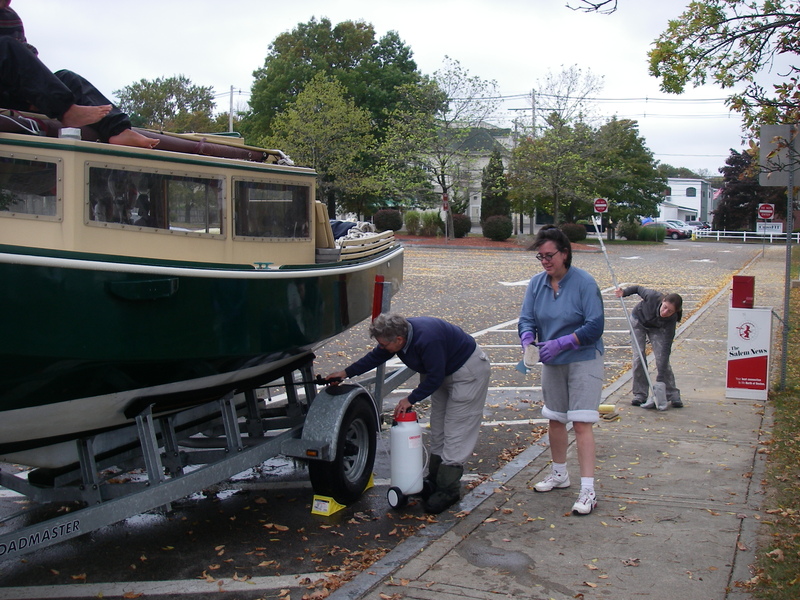 Cleaning the hull this time was easier than last year, partly because of the work it had been possible to do last week in the Jones River, and partly because of better equipment, and lots of help. This time we had a long handled brush, a scraper for barnacles, and a couple of other brushes, as well as a pump-up pressure sprayer, the kind sold for greenhouse and garden applications. That made the job easier! As did having so many folks helping. Thank you Suzanne, Melissa, Michele, Carolyn, and Jane! Many photos were taken, and Bob and Jane Hicks, from Messing about in Boats, were there, Bob with his “journalist” hat on, so who knows what might come of that. Susanne Altenburger, from Phil Bolger and Friends, also came to see the boat out of the water – modification discussions continue! It was a wonderful time, on all fronts. 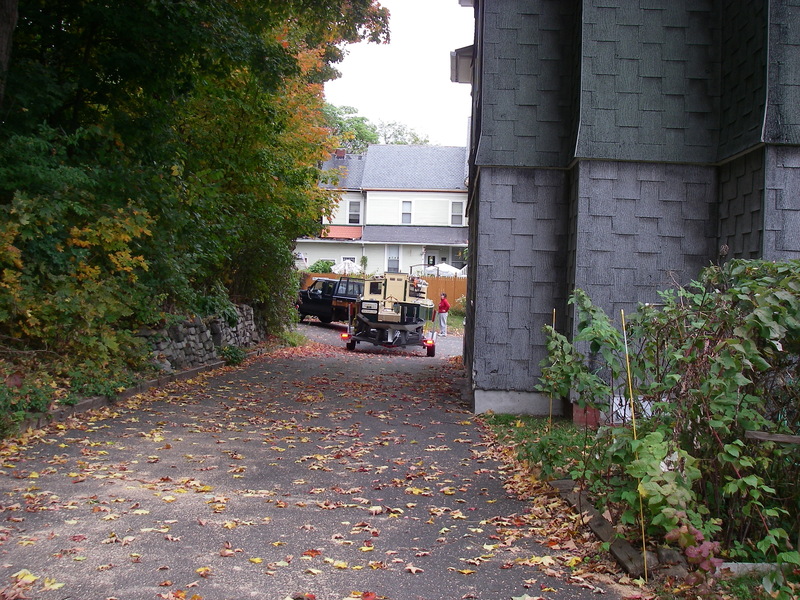 After everything was in order, Melissa and Richard hauled the boat to Holyoke with their substantial pickup truck, and on the way they took it to a truck scale. In case anybody was wondering, the boat and the trailer together weigh about 4700 pounds, with the boat somewhat more than half loaded, since a lot of gear had been taken off already. One guess on the trailer weight is about 1200 pounds, but it might be more. The next time that the boat is floating we’ll get just the trailer weighed, and know for sure. So that makes the boat, and a good bit but not all of the gear, somewhere in the neighborhood of 3500 pounds. That rather high figure would be both because I pack heavy, and added quite a bit of hardware as well as batteries to the boat itself, and because the actual construction was done a bit heavy rather than light. As I’ve said previously, the additional weight has been a benefit, rather than a problem. The boat isn’t quite as fast, but it’s more stable and more comfortable, well loaded. I noticed the difference in the marina after Suzanne took a good load of stuff home on Wednesday. The boat became noticeably more sensitive to both weight shifting and wakes. On the other hand, for those interested in light, quick response, one can go like heck in a lightly-loaded Chebacco boat! It’s a good time for reflection, when you haul a boat out of the water. I’m looking forward to sitting with what this time has been, in the next while. And there were quite a few things that happened that have stayed in mind but that I didn’t get a chance to write down. Hopefully that will be possible to catch up on now! Very many thanks go to all the people who have helped to make these last months of sailing possible. It’s a blog post all of its own, which is coming shortly, but in the meantime, my deeply grateful appreciation goes to every one of you. It’s an enormous gift that I have been given – thank you so much. Congratulations on the completion of your long cruise. Hope to see you next summer at Swan’s Island.